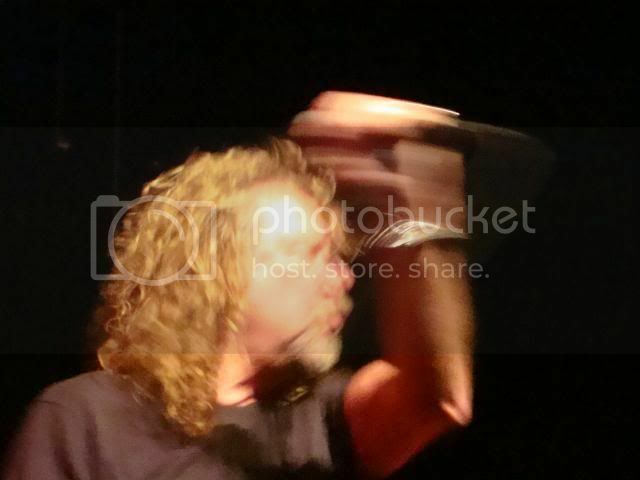 Starting this new thread for real-time updates on Robert Plant's 2011 Band of Joy tour. Request all the 2011 updates posted to the existing 2010 thread be moved here. Many thanks! 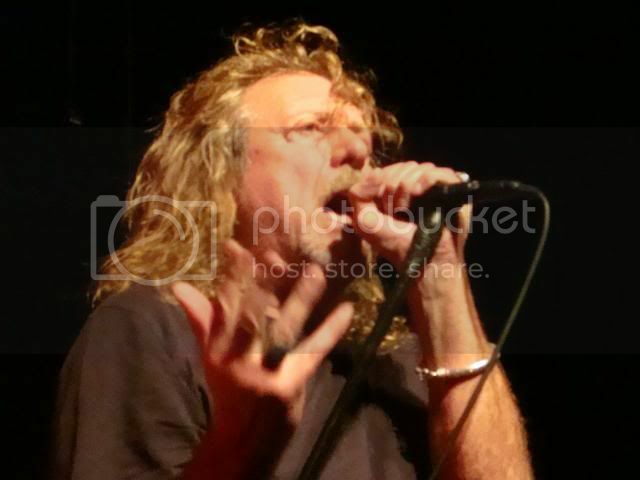 ANN ARBOR -- Robert Plant welcomed the crowd at Hill Auditorium to "another very interesting night of music" on Friday (Jan. 21). "Interesting" is, of course, the motto Plant has gone by since going solo in the wake of Led Zeppelin's 1980 break-up, and he's maintained a nearly unprecedented level of artistic integrity since then by going back to the golden goose only on rare occasions, and never for a full-scale reunion. Instead he's pushed in rich and unexpected creative directions, still maintaining a bit of his Golden God image of yore but mostly playing the ambitious seeker, rejecting any of the parameters or limitations his previous fame might have placed upon him. His new Band of Joy, which visited Ann Arbor with him, is the latest chapter in Plant's travels, and also one of his best. Adding an element of trippy psychedelia to the Americana path he embraced on 2007's "Raising Sand," the Grammy Award-winning collaboration with Alison Krauss, the Band of Joy -- and its album, "Band of Joy" -- proved as potent, unique and, yes, interesting as anything that Plant has done during his career and also seems to be only at the beginning of what could be a formidable run. Following a sharp 40-minute opening set by North Mississippi Allstars brothers Luther and Cody Dickinson, Band of Joy was led on stage not by Plant but by "Band of Joy" producer Buddy Miller, a nod to the more ensemble sensibility of the project. Plant is unquestionably the star, but Miller and multi-instrumentalist Darrell Scott certainly established a near-equal footing as players, while they and Patty Griffin each took a turn singing lead vocals while Plant dutifully provided backup and, on Miller's "Trouble," harmonica. Band of Joy's 21-song, 110-minute focused, not surprisingly, on "Band of Joy" selections such as Los Lobos' "Angel Dance," Richard Thompson's "House of Cards," Townes Van Zandt's "Harm's Swift Way, Low's "Silver Rider" and Plant and Miller's "Central Two-O-Nine," and also dipped into "Raising Sand" for "Rich Woman" and the Plant-Jimmy Page composition "Please Read the Letter." Then there were surprises, such as the spiritual "Twelve Gates to the City" and a couple of tunes plucked from Plant's 80s releases, including "Down By the Sea" and a rave-up rendition of "Tall Cool One." The big moments, though, came when Plant and company dipped into the Led Zep canon. "Tangerine" fit Band of Joy's intricate acoustic orientation to a T, while "Houses of the Holy," "Ramble On" and "Gallows Pole" were powerful even with the rootsy tweaks this ensemble added. "Rock and Roll," meanwhile, gave all under the Hill roof a chance to cut fully loose, whether it was Miller and Scott dueling on guitar and pedal steel, respectively, or the fans who danced ecstatically in the aisles. Closing the show with an a cappella "Goodnight," Plant praised the audience and its response, noting that, "You get it. I get it. We get it. What is It?" No definitive conclusions were reached, of course, except that "It" was pretty special. 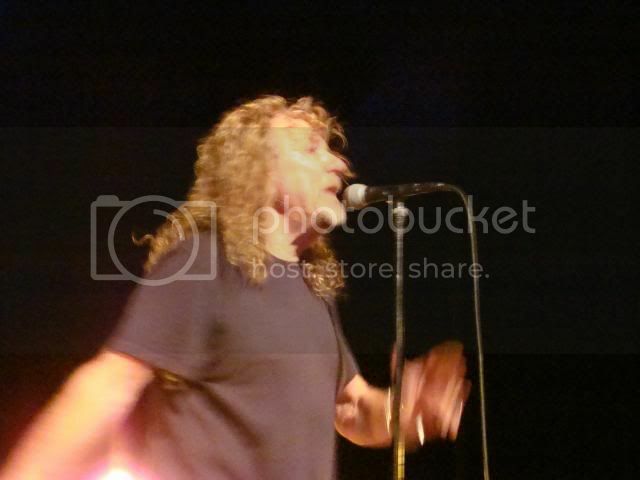 Robert Plant at Ann Arbor's Hill Auditorium. 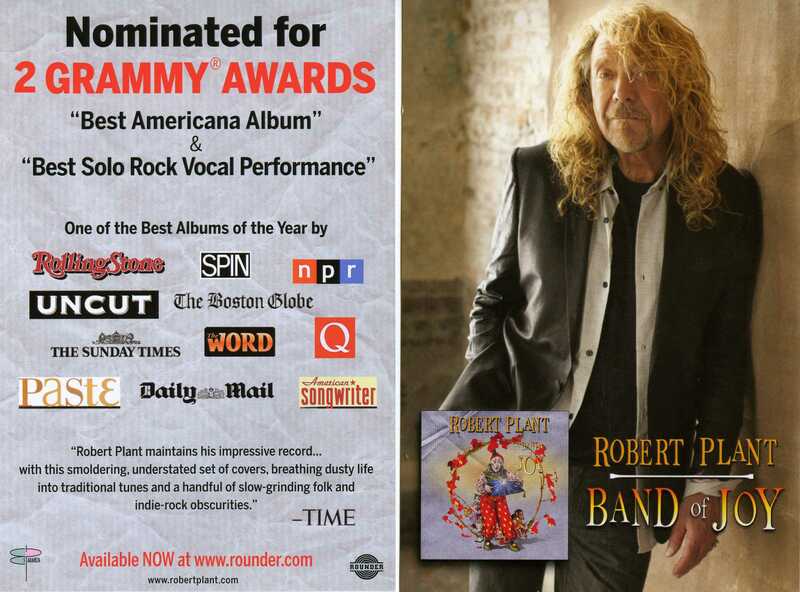 Suffice to say, Robert Plant has been entranced by American roots music for a long, long time, immersing himself in seminal recordings of old blues masters who inspired Led Zeppelin's heavy rock in the '60s and '70s. "The English have been quite famous for taking American music and re-presenting it to the Americans," the rock band's frontman told me in a 2002 interview. "There's nothing much left that the English can bring back to you guys now." On the contrary, Mr. Plant. Now in his 60s, the curly-haired singer has earned Grammy nods and drawn widespread acclaim for his reinterpretation of folk, bluegrass, country and rockabilly music in much-acclaimed studio projects with Alison Krauss ("Raising Sand") and his current "Band of Joy." 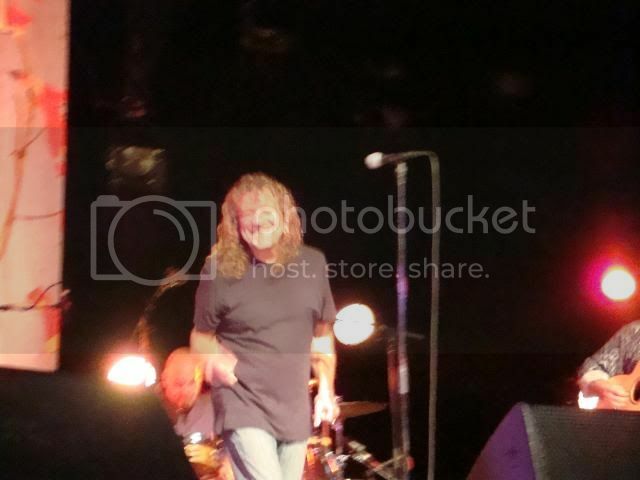 On Friday night in Ann Arbor's Hill Auditorium, he "re-presented" some Americana gems – along with revamped Led Zeppelin classics – in a way that not only held true to their soulful origins, but advanced them with a distinct Plant edge that absolutely beguiled the 3,000-plus fans on hand. He did it brilliantly, with a hefty helping hand from Patty Griffin on backing vocals and album co-producer Buddy Miller on guitar, on "Can't Buy My Love," a scorching, rockabilly-styled version of a mid-60s R&B tune. He did it as a sideman, playing an impressive bit of harmonica while Miller dove into a rollicking, crowd-revving version of the countryfied "Trouble." And the singer may have triumphed best of all with Miller, Griffin and the rest of his touring version of the Band of Joy (multi-instrumentalist Darrell Scott, bassist Byron House and spot-on drummer Marco Giovino) when he ended the night's main set with "Gallows Pole," the old traditional American folk-blues number that Led Zeppelin refashioned on its third album. Starting in spare fashion with Scott on banjo, the Band of Joy's rendition of the dark tune was scary and powerful, building to a dynamic, raise-the-hairs-on-the-back-of-your-neck finish that proved definitively that Plant's most recent music exploration project is a resounding success. After the duo version of the North Mississippi Allstars (Luther and Cody Dickinson) warmed things up nicely with a bluesy 38-minute opening set immersed in the deliciously swampy South, Plant and his crew got things rolling with Los Lobos' upbeat "Angel Dance," followed by "Please Read the Letter," which Plant and Krauss recorded for their "Raising Sand" album. The show's early vibe had a psychedelic flavor with Miller in a goofy hat (and tassels swinging from the head of his electric guitar) while Plant meandered between the musicians on stage. But when the band kicked into gear on "House of Cards," from Plant's "Band of Joy" album, everything seemed to really fall into place for this super-group of highly regarded musicians and singers. Plant seems to recognize the limitations of a voice decades removed from its heavy metal heyday, instead accentuating its resonant strengths on these slices of Americana – vocals which mesh beautifully with Griffin's higher, more crystalline strains. "It's a great thing, this Band of Joy. It's super-duper stuff," Plant crowed. "I'm proud to be part of this." From there, things only got more compelling, whether it was Griffin taking over lead vocal duties on "Love Throw a Line" or the band performing a lush, magical cover of Low's "lo-fi" song "Silver Rider," or tackling gospel-drenched tunes such as "Satan Your Kingdom Must Come Down," "12 Gates to the City" and "Wade in the Water," or eventually, unfolding its own rootsy takes of Led Zeppelin's "Tangerine," "House of the Holy" and "Ramble On," which took on a groovy, lava-lamp-like vibe. The journey into Led Zep-land clearly ignited the Hill Auditorium crowd, which ranged from baby boomers bred on Plant's legendary rock outfit to college kids still inspired by the influential group. 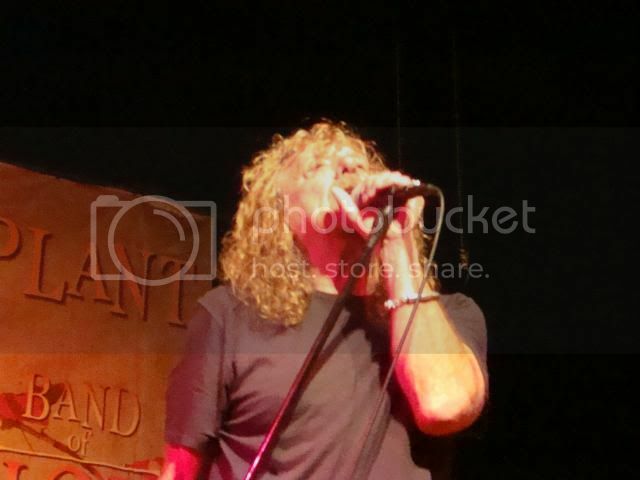 Plant, for his part, seemed absolutely jubilant about "re-presenting" those Led Zeppelin classics in a fresh way, including giving "Rock and Roll" a peppy, rockabilly twang during the encore. 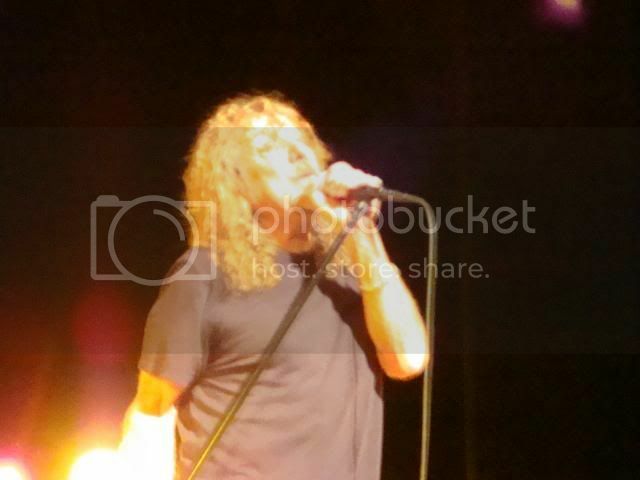 And at times, he still came off as the "golden god" of those days of old when Led Zeppelin played Detroit's Grande Ballroom, cradling his microphone stand with his head tossed back and his legs crossed on stage. "It's been a great night," Plant raved, before the group closed things out in gospel-drenched, a cappela fashion. If Rod Stewart has put out what seems to be an endless string of The Great American Songbook series, what's to stop Robert Plant from following suit with a bevy of eclectic covers touching on Delta blues, Appalachian roots and toe-tapping Americana? 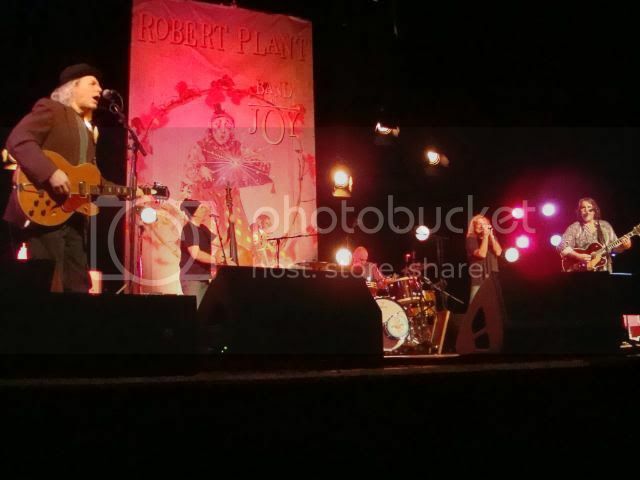 Following his surprising success with Alison Krauss on 2007's Raising Sand album, Plant returned to Toronto Saturday night at the sold-out Sony Centre for the Performing Arts behind last year's Band Of Joy, a record which seems a bit comfier for Plant and his stellar cast of alt-country musicians to pull off. Throughout the course of the 20-song set, the 62-year-old Plant often looked at singer/guitarist Patty Griffin, guitarist Buddy Miller and multi-instrumentalist Darrell Scott and repeated the word "yeah" off microphone, sensing it was going to be what he called "another scintillating evening" from the opening notes of the opener Cindy, I'll Marry You Someday. For the most part he was correct, especially on slower, groove-riddled numbers like Angel Dance with Scott on mandolin as Plant accidentally split his cup of tea. "I'm always prematurely spilling my tea," he quipped prior to Down To The Sea. While Miller, Griffin and Scott shone when taking the lead vocal on Trouble, Love Throw A Line and A Satisfied Mind respectively, Plant seemed to enjoy and excel in these still new musical waters on numbers like the fine Please Read The Letter and the winding, deliberate rendition of Richard Thompson's House Of Cards. And Plant also managed to deftly saunter through material from his Led Zeppelin period by reworking and retooling many of those numbers. This was especially true of Ramble On and Houses Of The Holy, the latter with the Jimmy Page hook still audible but surrounded by a sweet, roots-y feel that got a standing ovation from many. 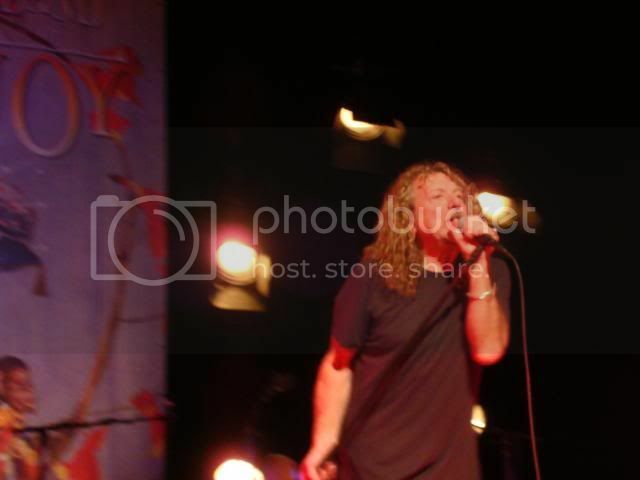 It was obvious from the beginning fans wanted their Zeppelin fix, but like his choice to opt out of a reunion tour following the widely praised one-off 2007 London show, Plant does what he wants. Yet this didn't stop him from acknowledging the past, referring to the venue by its old name the O'Keefe Centre and stating he knew some people quite well who played two shows there back on Nov. 2, 1969. As for miscues, there were a few, particularly when Plant's "last hit" Tall Cool One came across at best as average while Satan, Your Kingdom Must Come Down took a while to heat up as Plant belted out the concluding lines. After a crawling version of Gallows Pole - far different from the original foot-stomper - Plant and company returned for a short encore that ended with all six doing an a cappella version of And We Bid You Goodnight. Overall, it was a very good night indeed. Here's my review from the Jan 19th Pittsburgh show. I forgot to mention how good the opening act, the North Mississippi Allstars were. Two brothers, bluesy, rock with a country tinge. Guitar and drums only, at one point the drummer played the electric washboard. A band to explore further. Went to the Pittsburgh show last night and it was truly awesome! We were 7 rows back center, excellent seats. The sound was really good, way better than I could have hoped for considering the venue. The Peterson event center is basically a large gym, built primarily for the university of Pittsburgh basketball. It holds about 12,500 and is not designed for a concert, especially one that would be better in a smaller concert hall. There was probably a little less than 5000 in attendance and all around me seemed to really enjoy the vibe. They opened with Gallows Pole which was very unexpected,thrilling and set the tone for the evening. Robert was in great voice and great humor. Lots of Plantations and jokes and great interaction with the audience and the band. They did all of my favorite songs from the new album, House of cards, Angel Dance, Central 209, Satan Your Kingdom must Come Down. Encore was Monkey (yay! I thought they weren't going to do it) Rock and Roll and We Bid you Good Night(?) which were all spectacular!! Cant buy my love was a highlight and I think they may have screwed it up somehow because they were all laughing at the end and Robert said something like "that song is different every time we do it, as it should be." From the Zep catalog were Tangerine, which was spot on, Houses of the Holy, and part of In my time of Dying which was in the middle of a song by Gary Davis called 12 gates to the city which I never heard before. Please read the letter was perfect and Tall cool one was a shocker! What fun! And the band, oh my were they good! Patty Griffin has an incredible voice and did a song called Move up which was a highlight for me, and Darrell Scott and Buddy Miller also has lead vocals on two other songs. What a talented bunch on one stage! I am jealous that they did Down to the sea the previous night as that is one of my favorite songs and i would think it would have fit in well, but maybe they didn't think so. The only people that could be disappointed by the show were the youngsters in the Led Zep T-shirts that may not have been aware of his current album/sound. Anyone who begrudges him his chosen path should see this show. It might not be your bag, but you can tell how happy he is and how much they are all enjoying it. Truly the Band of Joy! Here's Robert opening night in Asheville. Great version of Tangerine. Thanks for sharing. Hopefully, they'll do this next weekend in NYC. Request all the 2011 updates posted to the existing 2010 thread be moved here. Many thanks! Careful, that request could very easily lead to endless thread stalking from Leddy. 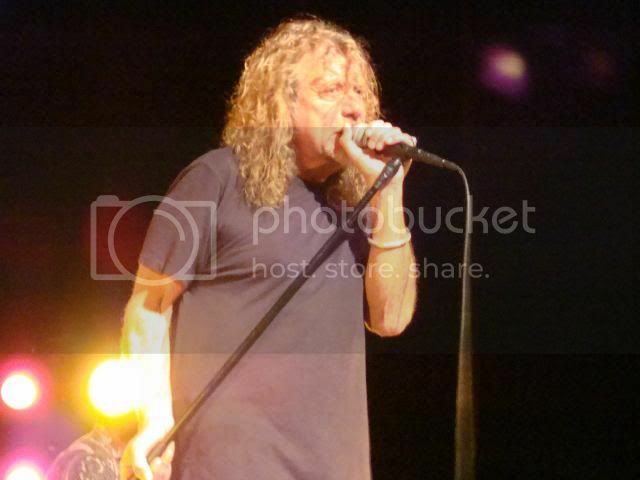 When describing Robert Plant in concert, it's tempting to make a double rainbow comparison. Not only are you in the vicinity of Zeppelin's lead singer — a man who helped build the metal genre and changed rock 'n' roll as we know it — but you're given a glimpse into another pop culture reality; an era defined by blood, sweat and tears and shaped entirely by the likes of men and women who made music solely because they meant it. 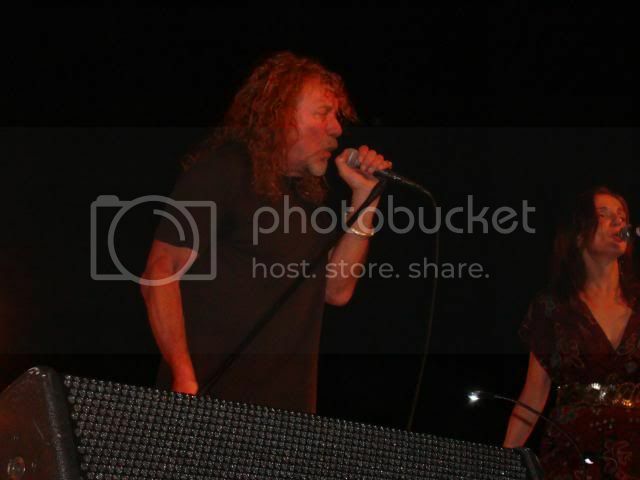 Saturday's show was by no means Robert Plant's answer to a 2011 Zeppelin reunion, though. Far from it. 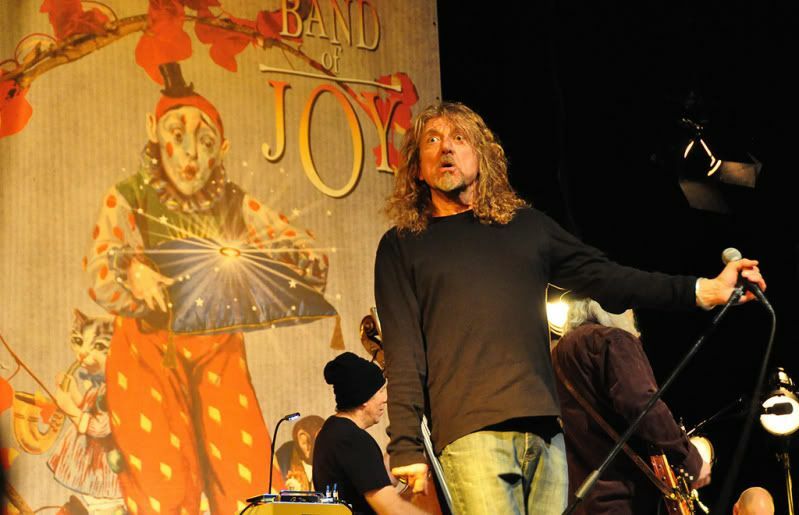 If anything, Robert Plant & The Band Of Joy proved that while some veterans choose to sit comfortably by their musical legacies, others stay true to the calling that sparked their creative genius in the first place. Cue: the group's self-titled debut album that's been critically praised and nominated for a Grammy; an endeavor far from the electrically-charged rock 'n' roll band that many fans signed up to see. But if they were disappointed, it's no fault of Plant and his band. From the opening song, Band Of Joy proved worthy of their accolades and showcased their obvious (albeit understated) talent. Suddenly, the over-the-top stage personas of today's biggest indie bands seemed contrived and lacking integrity — from the moment Plant stepped on stage, you could understand why his name is synonymous with relevance. Band Of Joy consist of bluegrass-based multi-instrumentalists, singers and songwriters. They represent the concept of collective, and each member was warmly introduced and given a platform to showcase their skills and abilities. True, Plant remains the draw, but despite the legacy surrounding him, he refused to deign to the concept of "star." At one point, he moved to the back and sipped his tea as members Patti Griffin and Darrell Scott offered their own vocal and instrumental stylings. Not all audience members appreciated it. 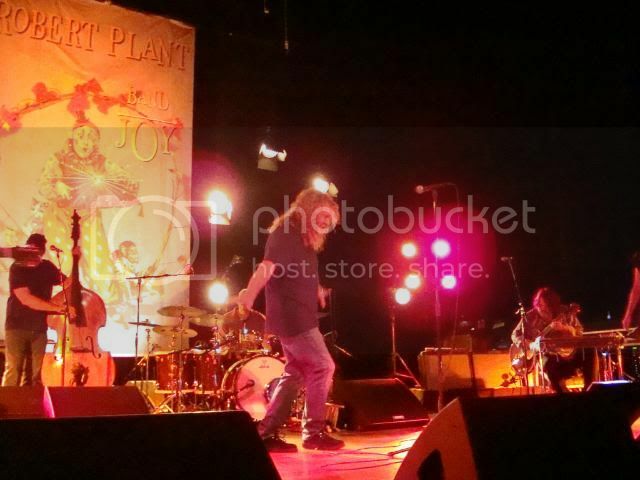 Despite Band Of Joy's warm, unified presence (further adding to the familial, folk-based vibe), certain fans were merely killing time waiting for Plant to get the Led out. But after a stripped-down version of Zeppelin's "Tangerine" (which was upstaged only by "Ramble On" and "Rock And Roll"), Plant's evolution as an artist became apparent: the singer has transitioned, and transitioned well. After all, he turned down a Zeppelin reunion tour to embrace his creative evolution — and isn't that why we love him in the first place? 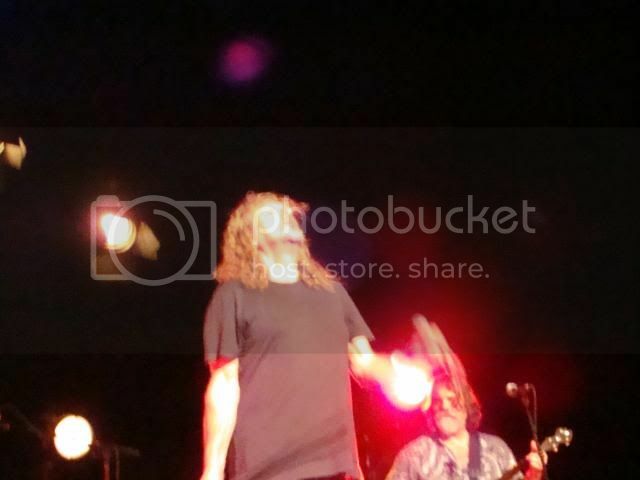 In short, watching Robert Plant & The Band Of Joy felt like a musical hug; a reminder that music lasts, that bravado is overrated and that true talent outweighs the fleeting nature of "buzz." While the "down south" sound of the group may not be appreciated by desperate Led Zeppelin graspers, it's less about the genre than it is about live presence and the lasting experience. Sometimes musicians create because they love it. All of these reviews and videos and photos are great! Thanks for posting these everyone. Gigi, I can't wait to meet you. If I start to act totally crazy, please have my back....it's ROBERT!!!! Having great fun watching the vids from this tour. Many thanks for posting them!! Separated at birth ? ? ? for a show with the North Mississippi Allstars. 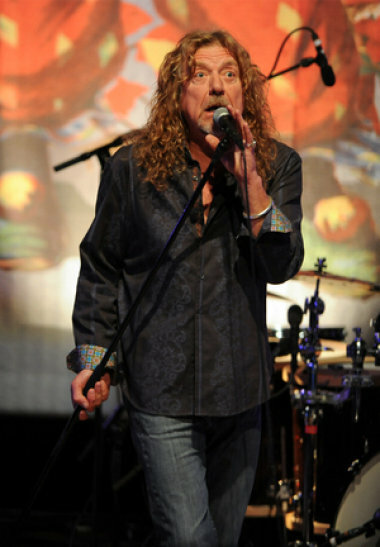 Since Led Zeppelin split following the death of drummer John Bonham in 1980, singer Robert Plant hasn't written off his legendary past there have been projects with Jimmy Page and a one-off reunion gig with the band's surviving members in 2007. 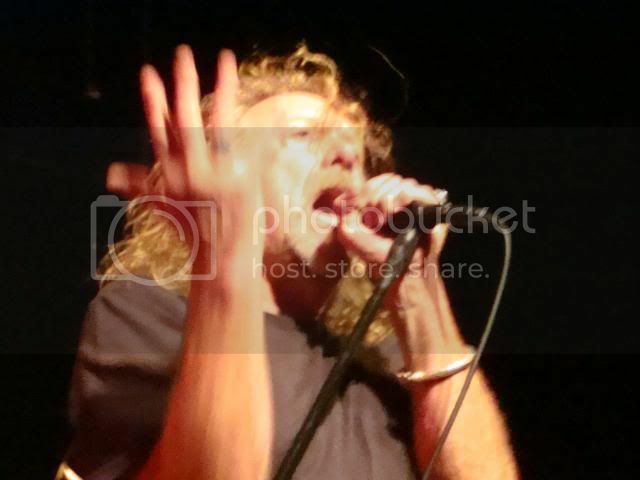 But Plant hasn't dwelled in the past, either, choosing to explore genres all over the musical map with a myriad of post-Zeppelin bands and solo projects. Now four decades into his career, Plant has really hit his stride in recent years. In 2007, he teamed with Alison Krauss for the album "Raising Sand." The unlikely pairing became quick critical darlings, taking home a half dozen Grammy Awards for their efforts. Plant followed that project up last year with the acclaimed "Band of Joy," putting an eclectic spin on traditional material like "Satan, Your Kingdom Must Come Down" and songs by the likes of Los Lobos, Richard Thompson and Low. Plant brings his first stateside tour with the Band of Joy to the MGM Grand Theater at Foxwoods on Friday, Jan. 28, for a show with the North Mississippi Allstars. Tickets for the 8 p.m. show are $50 to $75. Information: 866-MGM-0050 or http://www.mgmatfoxwoods.com. 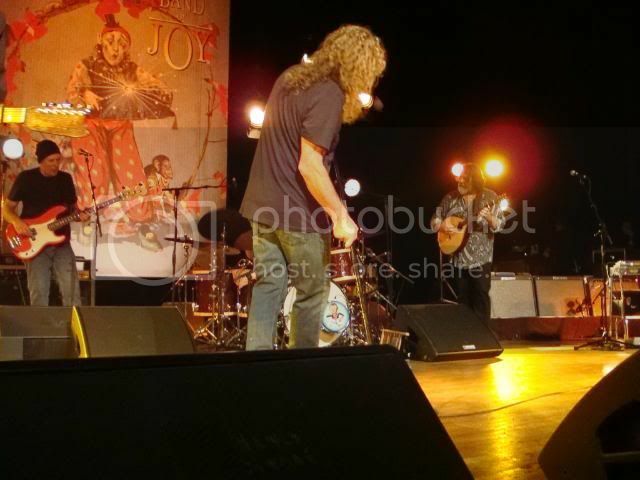 Robert Plant and the Band Of Joy are currently on the second North American leg of their tour, having played a series of US dates last summer prior to the album's fall release. This week, Plant announced that more shows had been added across the States in April.